Activities highlighted in RED are located at the Outdoor Music Stage. Activities highlighted in BLUE are located at the Tiny Traveling Theatre. Activities highlighted in PURPLE are located at the Tiny Firehouse Stage. Activities highlighted in BLUE are located located at the Tiny Traveling Theatre. 9:30AM: Tiny Traveling Theatre – Opening Announcements & Greetings. 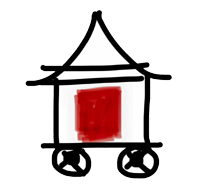 5:15PM: Tiny Traveling Theatre – Tiny House Awards Presentations, Prize Giveaways, and Closing Statements. Children’s activities, food concession sales, and tiny home tours will be available throughout the day. * Please Note: This schedule will be updated and is always subject to change.